President Trump cannot easily bring an end to the Russia investigation by firing Special Counsel Robert Mueller. Authors Noah Bookbinder, Norman Eisen, and Caroline Fredrickson explain that Deputy Attorney Rod Rosenstein, not President Trump, is the one who has authority to fire Mueller. While President Trump might compel others to do so on his behalf or instruct the attorney general to revoke DOJ’s special counsel regulations, the risks of doing so are prohibitive. History warns that he would be risking his presidency, not to mention increasing his exposure to charges of obstruction of justice. In addition, we explain that any firing could be subject to court challenge by Special Counsel Mueller, his staff, and possibly other parties. Mueller’s firing also would not necessarily bring an end to the investigation that he is leading. 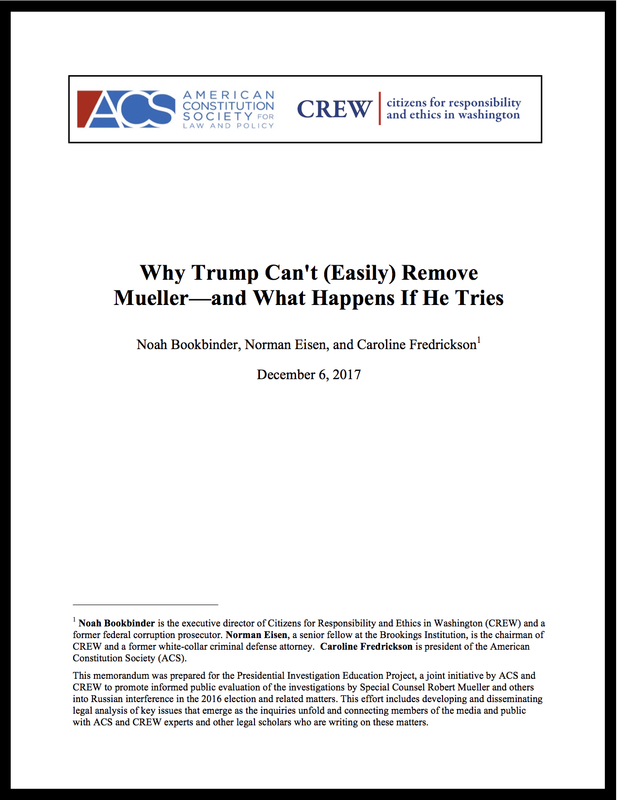 Finally, we explain the ways in which Congress might make it even harder for President Trump to end the Russia investigation by codifying the special counsel regulations and pre-committing to a course of action that would deter interference with the Russia investigation. This memorandum was prepared for the Presidential Investigation Education Project, a joint initiative by ACS and CREW to promote informed public evaluation of the investigations by Special Counsel Robert Mueller and others into Russian interference in the 2016 election and related matters. This effort includes developing and disseminating legal analysis of key issues that emerge as the inquiries unfold and connecting members of the media and public with ACS and CREW experts and other legal scholars who are writing on these matters (click image to open report).